There are certain moments that drastically alter the trajectory of a life-path. Being open and aware to those instants is absolutely essential regardless of one’s career. I had ordered a computer as soon as I found out that my talk The New Folk Tradition: Aesthetic and Community Resonance between Open Source Graphics and Fiber Arts was accepted at the beginning of May. It was to be my first new computer since 2004, and boy was I due! Unfortunately the delivery from Lenovo did not arrive by the 24th when I left. So in a bind I decided to stop by Fry’s on the way to LAX and pick up a little Acer Aspire One netbook. I arrived in London, downloaded Jolicloud which is based on Ubuntu and started to play around on the train to Brussels. The issue was that I’d not used Unix/Linux since I worked in Motorola in 1999…my how things have changed, so easy to use (yes I like GUI)! So I thought that I was going to give my presentation using Open Office, well when I saw How to Run an Art School on Free and Open Source Software by Florian Cramer, Aymeric Mansoux, Michael Murtaugh I was blown out of the water by their image-centric presentation. I got to chat with them after the talk, and they told me about the FOSS program Impress!ve. At this point, Christopher Adams showed me how to use a shortcut (alt + F2) to access the repository by calling on gksu synaptic. So at that moment I scrapped my plans of the standard Power Point-esq (gasp) presentation. After just a few hours at the LGM I already knew how to utilize new tools, and put down some roots with other artist do-ers with similar interests. Rad. 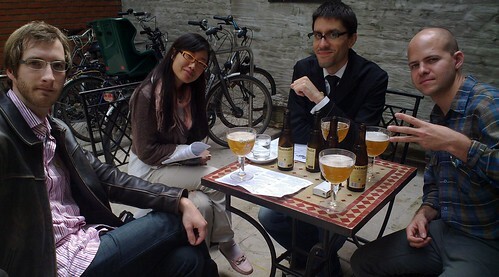 After a vegan lunch we relaxed in the courtyard drinking Belgian beer (thank goodness for the Westmalle tripel) and getting to know our peers. Another important aspect for me was the instant application of what I learned. WiFi was free and available all over the complex, so while you were watching a talk you could download and try out the software to apply the concepts that were being explained. In addition, birds of a feather (BOF) meetings were scheduled so that people with similar interests could gather to speak about a topic. In my case I was inspired by Susan Spencer’s talk and her project relating to OPEN FASHION. You can learn more at Sew Brilliant. 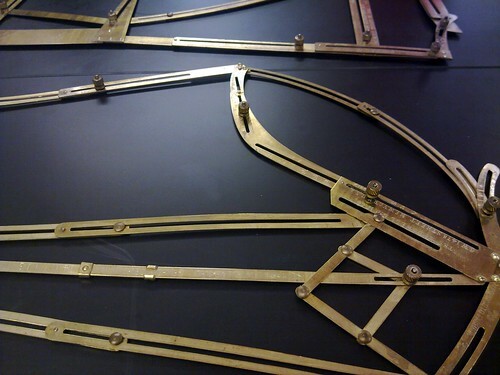 In the BOF meeting, she pulled out one of the most amazing contraptions I’ve ever seen, it was a brass pattern adjuster, that would change scale by rotating a series of screws in a certain order. She even had the manual that dated from 1888. Basically it was a slide rule for tailors and seamstresses. Susan’s and her partner Steve Conklin (who is a developer for Ubuntu) have a vision where a designer can upload a pattern, another person (who may not be the same size) can adjust it to fit using the program which is based on scalable vector graphics, print and tape up the pattern and sew the custom garment. What an excellent idea, so naturally I included it into my talk. Now check out the video of Pete Ippel relating Asian stitching, 80’s sweaters,Tron, quilts, and weaving to open source graphics. 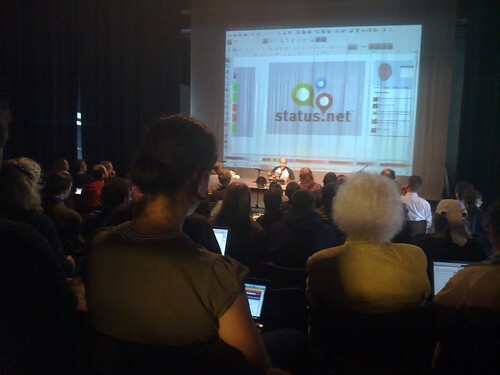 Each day of the conference the organizers kept the program on schedule, and the diversity of the talks really demonstrated an expanded view of Libre Graphics. Thanks to River Valley TV for archiving all the LGM 2010 talks. In addition to software development, there were presentations about metaphor, Tight Pants, Community, publishing, font design,multimedia sound performance, and some miraculous demos. I was particularly impressed with Laid Out and the new brushes for Krita. It is incredible how generous people were at the conference, as a n00b it was invaluable to be able to ask a question and get a straight answer, and if the person asking didn’t know, they would refer you to someone who did…The organizers wore aprons and buttons and were always available for help. I began to understand this overarching theme after a few days into the conference. Formerly I’d been envisioning code as magic. After seeing the Nodebox 2 demo, I downloaded the beta and was able to modify an image or a line of code to make changes to an output. That was a huge breakthrough for me I saw directly that through transparency comes understanding. That’s what F/LOSS gives when code is viewable and modifiable the developer and user are on an even plane, and both can create new tools to suit their needs. There exists a sense of community that is absolutely impossible with closed code. I’ve been licensing my art under Creative Commons for a few years, and I am confident that as the young people who have “grown up digital” and the first generations of free culture pioneers continue to push for more openness and transparency on many facets of life from government to software, clipart to color we are in for a very exciting ride. Please visit the review page for other articles, photos, and a video archive of all the Libre Graphics Events. If you find yourself in Brussels, use the map below to visit the Pianofabriek. It’s an amazing arts / culture venue with a lovely courtyard, gallery space and cafe. Often growth is sparked by a change in community…prompted by a different geographic location. In October 2002, I had just moved to San Francisco and was looking for community. Leaving the comfort of my undergraduate institution and support network in New York, I was seeking attachment to my new home. I initiated a project called “Free Memory” where the intent was to give away an anonymous gift that brought attention to technology and our relationship with memory both on a disk and in our mind. Looking back at the task I stated that free meant free from price, obligation, need to pay, and also free content. The Free Memory Project from Thorsten Claus on Vimeo. After creating the project OBAY.INFO I was contacted by council for Ebay.com and subsequently looked to Lessig’s Group at Stanford (which lead me to Creative Commons), was fingered in a Canadian Ad Campaign, and was invited to the To Share Festival in Turin Italy. Read all the posts about Obay. Following Obay project I took a job working as a mentor for pre-professional dancers at the San Francisco Ballet. Over the six years I was there, I learned that a robust community was built with freedom. What I found was that kids would act more like adults when they were given the opportunity to do so. The same was true when I coached high school basketball for 4 years. I left the Ballet at the end of 2009, and when I moved from San Francisco to Ventura, California, I began an intense production phase to kick-start my full-time art career. By comparing pixels to patchwork, vectors to stitches, bitmaps to patterns, and layers to quilts, I started to discover the aesthetic and community relationships between open source graphics and the fiber arts. Thank you to Jon Phillips, Barry Threw, Christopher Adams, Femke Snelting and everyone else at LGM 2010 for helping me feel so welcome in this amazing community.